I’ve always wanted to see a small pamphlet entitled “Volunteer Services for Dummies” or maybe “Volunteer Management, The Cliffs Notes.” Then I could sneak around and slip that bad boy under the door of the executive director while he was at a conference on “How to Get Donors to Donate More.” The pamphlet would have a way to insert whatever author’s name would impress him, like maybe that consultant who he’s recently hired to tell him that he needs to get more donations. So, forget the pamphlet. Let’s just list the ten top things that I wish CEOs would understand about volunteer services. 10. Volunteers do not sit by their phones waiting for us to call. Shocker! We don’t just “order up” volunteers when someone asks for eight volunteers who can work twelve-hour shifts, outside, tomorrow at 8am. Yeah, no one wishes it were that easy more than we volunteer managers. Asking volunteer Charles to prioritize volunteering with us over his other volunteering activities, his trip to Bermuda (that he’s saved years for), his managing of his elderly mother’s affairs, and his scheduled surgery might just be a tad unrealistic. 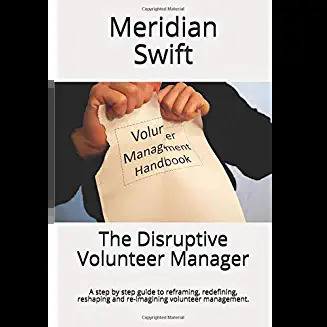 It takes a wise volunteer manager to know how to balance volunteers’ experiences so that volunteering is not burdensome and they look forward to coming in to help. 9. 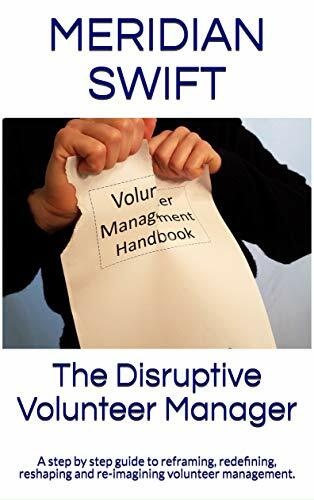 Managing volunteers is not like managing staff. Wow, bigger shocker! Unless managing two to ten times the number of very diverse people who only work maybe four hours a week without pay is the same thing. Instead of a paycheck to dangle, volunteer managers must use real leadership skills to inspire and coordinate volunteers. Think of it this way. Volunteers typically spend about 4 hours a week volunteering while you, the Executive Director and your staff spends upwards of 40 or 50 hours a week working for the organization. That’s at least ten times the amount of “plugged in time” you have over volunteers. Do you think that the volunteers spend the other 36 hours thinking about our organization? If not, volunteer managers must be able to “plug-in” volunteers every time they arrive on scene, motivate them to achieve that connection and keep them informed of changes and updates. 7. Volunteer managers are real managers. “Hmmm,” the executive director might be thinking, “No way, not in the same way our manager of fund-raising is!” Well, no matter what you call them, coordinators, specialists or team members, volunteer managers are as much a manager as anyone on your staff. The list of skills needed to lead and cultivate a team of volunteers (see #9 and #6 and #4 and #3 and #2 and #1 and oh heck, all of them ) is quite extensive. 6. Volunteers want meaningful work. “So,” the CEO may be thinking, “but I often need some meaningless stuff done. Who will do it?” That’s true, but volunteers do not want to just do what the staff doesn’t want to do, they want real jobs that make a difference. And since we don’t pay them, maybe we should consider meaningful work as pay? But, a great volunteer manager with awesome skills can lead volunteers to occasionally do the grunt work if grunt work isn’t all that is offered. 5. Volunteers want sincere appreciation from more than just the volunteer department. An Executive Director might be thinking, “Hey! I always say that we couldn’t operate without our volunteers, don’t I?” Yeah, you do. But guess what? Volunteers see through the once a year speech at a luncheon that is just lip service. Volunteers want you to make an appearance and say hello, send hand written thank you notes and include their accomplishments the next time you meet with the board of directors. And oh, they would like you to genuinely encourage staff to do these things too. Volunteers are either an integrated valued service or it’s all just talk. 4. Volunteers are not just little old ladies drinking tea. “But,” a CEO could say, “they sure look like that description ha ha.” Did you know that volunteers are diverse in every way, including age, background, culture and experience and that it takes some major skills to manage a group of very diverse people? But even if some volunteers are older, did you know that they are former executives, professors, leadership experts and full of wisdom and great ideas? And they’re more than willing to share their wisdom for free. 3. Volunteer managers are not lap dogs. “Hey,” the Executive Director would protest, “I never said that!” But are the volunteer managers treated that way by staff? Is there an “order up” culture in which volunteer managers are expected to just get volunteers without having any meaningful input into volunteer requests? Volunteer managers have their fingers on the pulse of the organization and are privy to every aspect of the mission via volunteer involvement. Maybe, just maybe, your humble volunteer manager is really a great motivator and leader and not just an order taker. Check them out for some really awesome ideas and managerial skill-sets. 2. Volunteers are aware and talk. “Sure, so what, that’s great,” a CEO might agree. But, when a volunteer hears negative speak from staff, or sees something less than perfect, guess what? They talk, to each other, to friends, relatives, and the cashier at the Quick-Mart. Volunteer managers keep volunteers motivated and inspired and mediate constantly to make sure the volunteer’s concerns are resolved and their experience is positive. In this world aching for transparency, volunteers are the town criers who can proclaim the worth of an organization or do damage to its reputation. 1. Volunteers don’t stay forever. “Heresy! They should if the volunteer manager is doing her job,” an Executive Director could counter argue. No, actually volunteers don’t. Does staff stay until they die? No, and neither do volunteers. We should recruit, train and cultivate our volunteers just as we do staff, but not expect them to continue until they’re carted off in an ambulance. And, just like staff, sometimes we don’t want them to stay, so that’s why the professional skill-set of the volunteer manager is so crucial. A volunteer manager’s professional resolution to a challenging situation is an organization’s best chance to avoid negative publicity. So, there you have it. I’ll bet you volunteer managers have some really great ideas on other truisms that belong on this list. You have my permission to print out this list, slip it under your leader’s door. Somehow add to it that it was authored by the “Center for Outstanding Management and Maintenance of Organizations and NGO’s” via the report from the “Study on Excellence in Non-profit Structure and Ecosystems” or COMMON SENSE for short. 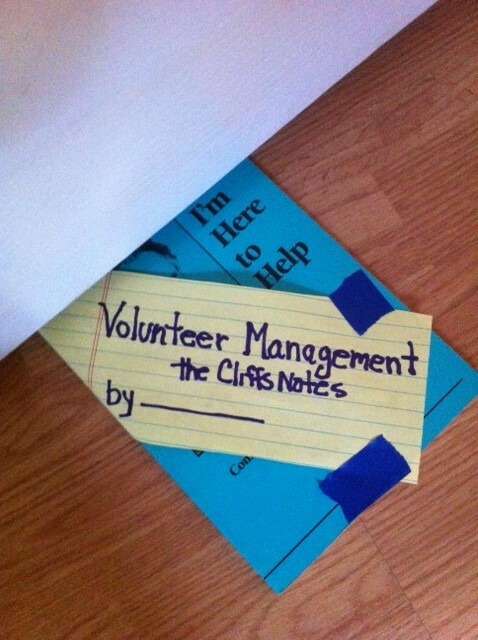 This blog, and this post in particular, is an antidote for volunteer manager burnout. Thanks Meridian! Hi Christine and thank you! It’s comforting (kinda like microwaved peanut butter over vanilla ice cream…mmmmm) to know that we all have similar challenges. Hopefully our community of volunteer managers can bolster each other and advocate for more understanding and recognition of our volunteers and therefore volunteer managers. This is fabulous! And I think it would be eye-opening for staff and even volunteer coordinators as well. I find that as things her busier and busier, people start to see and treat one another according to their function (get breakfast for room three) rather that’s holistically and part of a team. I often wonder how it is we have become so busy, when all that’s reay happening is the sacred “business” of dying. Fabulous post on one of my favourite blogs. I suggested it might well be shared among staff and co-ordinators as well! Good for thought for sure – and funny! Thanks!!! The hospice blog is definitely open to all. I’d love for volunteer managers to join me! Love this, Meridian! Exactly on point and funny, too! Where can I contribute to COMMON SENSE to make sure it spreads (like a virus)? Hi Susan and thank you! Heck, it might just catch on!